367 days ago at this time, I was hugging my beautiful Toronto work friends goodbye. I remember feeling a happy fluttering in my belly, along with a strong urge to throw up. Walking away from my downtown office is when I actually internalized the fact that, for better or worse, I was finishing and beginning an adventure. This popped up on my phone on May 31, 2014. 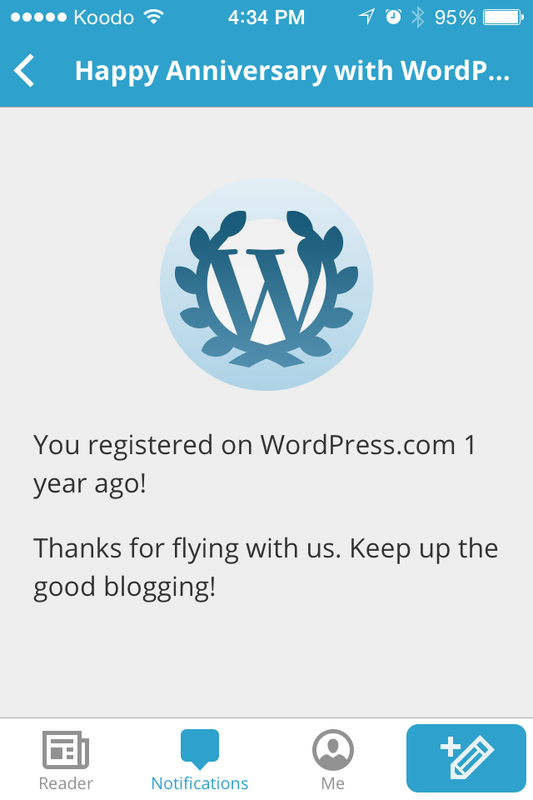 Thanks WordPress! The night before, I had spent an hour hammering out my first blog post. Reading it brings so many feelings back into my head and heart. It was exhilarating to know we were finally going to give our dream lifestyle a shot. And horrifying to think we were leaving stability behind. In the days that followed, I called our wonderful landlords (how I now admire their impeccable yard skills!) to tell them we were moving. I picked up dozens of regrettably empty boxes from the LCBO. And we ordered last suppers from our favourite delivery places — I miss you, Banjara Indian Cuisine. Fast forward to now, when I’m often asked if the whole thing was worth it. It’s a tough question to answer. Most days, I say yes. In this new life, I cook more, see JF more, read more, spend more time living en francais, see family more, and give back to causes that mean more to me. I also love working on our house, in our garden, in our little town. But is our new life everything we expected? Of course not. I still overload my schedule. I haven’t properly broken in my new purple sneakers. My job is great, but short-term. Our red brick beast/house adds a whole new layer of busy. The hammock we pictured ourselves regularly lying in hasn’t even been installed. And there are Toronto people and things I miss ferociously. After weighing both then and now, I’ve concluded that I’m closer to who and where I want to be than I was a year ago. I’ve also decided it’s important to have those someday dreams. But it’s equally important that I remember to enjoy the lumpy, potholed (or these days, mosquito-ridden) road I’m on. At the very least, I think I’m headed in the right direction. Dandelions in a farmer’s field by our house. I know I’m supposed to hate them, but I like them. My clothesline. It squeaks and doesn’t move up and down very well, but it’s mine! This entry was posted in Lifestyle, Love, Family and Friends, Personal growth, Small Town Living and tagged annivesary, Blogging, Elmvale, Francophone, Francophonie, Indian Food, leap of faith, life, life change, move, Moving, one year, Toronto, town to country, victorian house by Mikaela Lefaive. Bookmark the permalink. Ahhh what a beautiful post! Mi-kay, you’re such a great writer – no wonder you’re in Communications! You are loosing a lot of traffic. You need high PageRank backlinks to rank in top ten. I know – buying them is too expensive.